William Colburn began his technical career compounding cermet materials for high temperature applications after a stint at the Air Force Monitoring Rocket Development in the former Union of Socialist Soviet Republic (Russia) were he spend three years monitoring the USSR's activities in the aerospace and missile fields, but not within the USSR. Soon after his cermet work, he became an engineer with Precision Technology, a spin-off from Lawrence Radiation Lab in Livermore, California. He began designing ordnance systems and eventually became the Staff Engineer guiding and evaluating the technical output of the company. His work was noticed by Thiokol Reaction Motors and offered Colburn a position in the Igniter group which led to his participation in the formation of a three person Advanced Design Group. 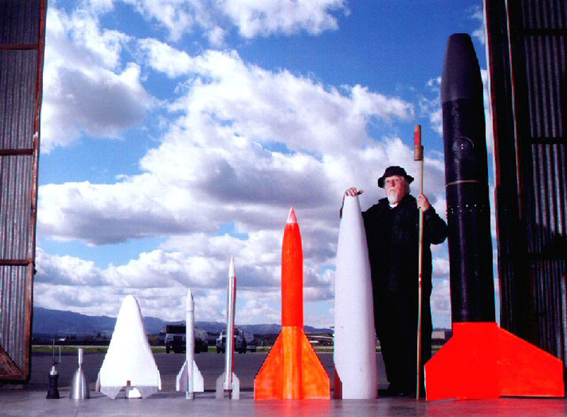 Bill was the head of an ordnance test facility as part of his technical growth. Mr. Colburn started his career in rocket propulsion by writing a paper on rockets at age 12, and was followed with a life time of experience with rocket propulsion and ordnance systems. Bill is currently Vice President of Research and Development at MAS, Inc. a small aerospace company and Chief Technical Officer of Ferredyne Group, LLC. a consumer products company. He also heads up two not-for-profit propulsion organizations (Sub Orbital Rocket Amateur Class) developing hybrid rocket propulsion. The SORAC project was founded in 1995 as a Civil Experimental Aerospace endeavor, with a first goal to place a totally non-government funded vehicle into internationally recognized space, 62 statute miles straight up. The group numbers about 30 persons across the USA, with a local contingent of about 10 persons performing the actual mechanical work on the vehicles. All vehicles use safe and inert-till-fueled Hybrid Propulsion Systems. Bill met Nino Amarena in the late 1990s and both shared their respective passion for rocket propulsion, leading to Colburn collaboration with Thunderbolt Aerosystems in the development of a novel "cool gas" hybrid rocket engine cartridge that will eventually replace the need for hydrogen peroxide and utilize ready-to-purchase and inexpensive oxidizers. The research on this new approach to rocketbelt propulsion, has merited an intellectual property protection application with domestic and international patent offices.